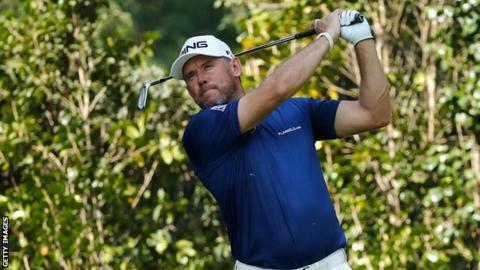 Lee Westwood is in a six-way tie for the lead after round one of the World Golf Championships event in Mexico. The Englishman, 43, was on course to be the sole overnight leader but bogeyed the final two holes to finish with a round of 67 in Mexico City. Westwood is joined on four under by compatriot Ross Fisher, Americans Phil Mickelson, Ryan Moore and Jimmy Walker and Spain's Jon Rahm. World number three Rory McIlroy is a shot further back after a 68. The 27-year-old Northern Irishman is playing his first tournament after seven weeks out with a rib injury. McIlroy made par on 14 holes, hitting one eagle, two birdies and one bogey in a solid round. Westwood was more uneven in his scoring, making eight birdies in his first 16 holes before ending with back-to-back bogeys to add to two others earlier in his round. England's Chris Wood and Spain's Sergio Garcia are part of a six-man group tied for seventh, a shot behind the leaders. Tommy Fleetwood carded a two-under-par 69, a shot ahead of fellow Englishmen Tyrrell Hatton and Justin Rose, with world number one Dustin Johnson also on one under.